To the good news for all Indian Railways travellers, people who have been travelling to Bengaluru from Eastern and Northern India and vice versa is getting a boost in the few coming days. The work is about to complete on the new Guntakal Kalluru route of South Central Railways in this financial year. The new route is meant to meet the dreams of all Rayalaseema people, along with better rail connectivity and more number of trains running along. As per South Central Railways CPRO Chairman Rakesh, he stated that once this route will get operational, there will be no more train delays and faster movement will be there. Also, the existing section provides the connectivity in between these areas and it will cut down the stress too and is meant for the faster movement of the trains. To improvise the mobility of train operations, Guntakal Kalluru doubling and electrification project is on top priority. The electrification and doubling of the project is under quick progress and is targeted to get finished by March 31, 2019. This project is important by pass rail line stretching over a long distance of 41 kms linking the main line among which the trains from Mumbai, Delhi and Hyderabad will be heading towards Bengaluru. The project was sanctioned in the 2015-16 financial year and the estimated price is Rs. 357 Crore. Till date, the expenditure that has been spent is Rs. 210 Crore. It’s been like a bypass line running in between Kalluru and Guntakal from Bengaluru. Also, it is the most accessible and shortest stretch route that connects to many prominent cities of Southern India and where most of the rail lines were heading towards Bellary, Hubli, Hyderabad, Goa, Raichur, New Delhi and so. This route is also known to cater the freight traffic and goods train majorly the ones containing cement, iron ore, steel and more. In the neighbouring districts of Kurnool, Kadapa, Gulbarga and Bellary, there are a large number of cement factories feeding the cement traffic on the route. 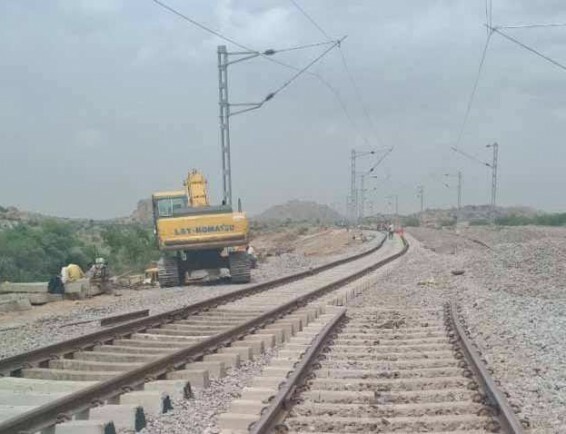 The Guntakal Kalluru double line section is been heading via drought impacted Anantapur district that comes in Andhra Pradesh. This double line is been known to be linking Bengaluru, Dharmavaram and Guntakal without even touching Gooty that will give a boost to the passenger services along with the mobility of the locals and users residing in the area, which acts as a catalyst for the social and economical progress of the people. At present, there are about 15 pairs of passenger trains involving non daily running ones in the doubling and electrification meant to be facilitating facilities and services to give a rise to the number of train services. Doubling of the section could be crucial to run more number of goods trains on the same and that too in an efficient manner.